The youth of St. Peter’s United Church of Christ of Elkhurst, Illinois, go on a mission trip every summer, but the adult members of the church are not about to let the kids have all the joy and the Greater Blessing that comes with putting faith into action. According to church member Scott Ahlgrim, the adults have been going on mission trips of their own for at least 12 years. For the past three years, they have worked with The Fuller Center for Housing in Macon, Georgia, turning vacant eyesores of properties into beautiful, like-new homes for families in need. Not only do members take mission trips like the one last week to Macon, but they also help a local food bank and an agency to help support the homeless, among other outreach programs. Their faith-in-action philosophy has gained so much traction that even church members who have left the area still join in mission trips. In fact, last week’s service work in Macon included two former members now living in Tennessee and one from South Carolina. Ahlgrim says it is particularly rewarding to look into the faces of those he is helping and seeing their gratitude and hope. This home in Macon will be going to a very appreciative, hard-working mother of four — Demetrice Howard. They did have to go without one thing last week, though — Chicago-area winter weather and chilly temperatures. It was sunny with afternoon highs topping out in the low 80s throughout the week in Macon. 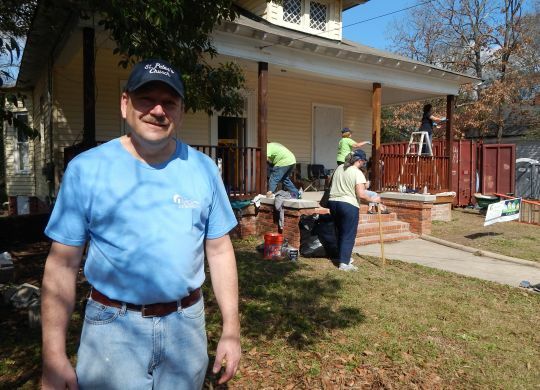 Click here to see a photo gallery of St. Peter’s UCC’s work in Macon.